Last night I attended and witnessed joy at my brother’s wedding. This morning, I woke up to the devastating news of the havoc wrought by super typhoon Haiyan in the Philippines. There were fears that the typhoon was headed to Vietnam. Mother Nature again had struck, and this time, with the greatest force. At times like this, we often think that there is little we can do to help, especially if we live far away. However, there are organizations that make it possible for individuals to donate. - To help children, Save the Children is offering disaster relief support for children in the Philippines, Laos and Vietnam after Typhoon Haiyan. 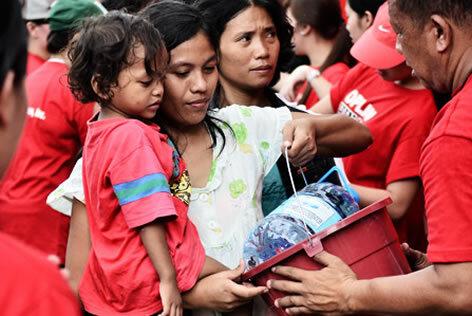 We can support their Philippines Annual Monsoon and Typhoon Children in Emergency Fund online. - For emergency support, the Philippine Red Cross (PRC) has rescue and relief teams to evaluate the damage and to support rescue efforts. We can donate to the Philippine Red Cross by choosing the Supertyphoon Yolanda campaign on their donation page. - For food and water, World Vision is responding by providing emergency food and clean water. They also created child-friendly spaces to help families rebuild through their online response fund - Philippines Disaster Response Fund. Our thoughts and prayers for the affected people and families in the Philippines.